Abcam’s IL-6 Human High Sensitivity in vitro ELISA (Enzyme-Linked Immunosorbent Assay) kit is designed for the quantitative measurement of IL-6 in supernatants, buffered solutions, serum, plasma and other body fluids. This assay will recognise both natural and recombinant Human IL-6. A monoclonal antibody specific for IL-6 has been coated onto the wells of the microtiter strips provided. Samples, including standards of known IL-6 concentrations, control specimens or unknowns are pipetted into these wells. During the first incubation, the standards or samples and a biotinylated monoclonal antibody specific for IL-6 are simultaneously incubated. After washing, the enzyme Streptavidin-HRP, that binds the biotinylated antibody is added, incubated and washed. A TMB substrate solution is added which acts on the bound enzyme to induce a colored reaction product. The intensity of this colored product is directly proportional to the concentration of IL-6 present in the samples. This kit will recognize both endogenous and recombinant Human IL-6. Get results in 90 minutes with Human IL-6 ELISA Kit (ab178013) from our SimpleStep ELISA® range. Cytokine with a wide variety of biological functions. It is a potent inducer of the acute phase response. Plays an essential role in the final differentiation of B-cells into Ig-secreting cells Involved in lymphocyte and monocyte differentiation. It induces myeloma and plasmacytoma growth and induces nerve cells differentiation Acts on B-cells, T-cells, hepatocytes, hematopoeitic progenitor cells and cells of the CNS. Also acts as a myokine. It is discharged into the bloodstream after muscle contraction and acts to increase the breakdown of fats and to improve insulin resistance. Genetic variations in IL6 are associated with susceptibility to rheumatoid arthritis systemic juvenile (RASJ) [MIM:604302]. An inflammatory articular disorder with systemic-onset beginning before the age of 16. It represents a subgroup of juvenile arthritis associated with severe extraarticular features and occasionally fatal complications. During active phases of the disorder, patients display a typical daily spiking fever, an evanescent macular rash, lymphadenopathy, hepatosplenomegaly, serositis, myalgia and arthritis. Note=A IL6 promoter polymorphism is associated with a lifetime risk of development of Kaposi sarcoma in HIV-infected men. Our Abpromise guarantee covers the use of ab46042 in the following tested applications. 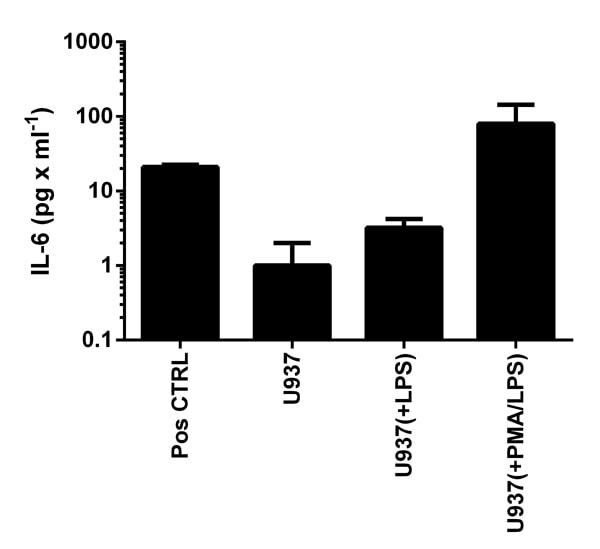 IL-6 was measured in cell culture medium from U937 control cells, or cells stimulated with LPS (1 �g x mL-1; 6 h) or PMA (10 ng x mL-1; 24 h) and LPS (background signal subtracted) (duplicates +/- SD). Publishing research using ab46042? Please let us know so that we can cite the reference in this datasheet. The assay has adquate sensitivity for my application. My application was to evaluate IL-6 level of human blood after exposed to Foreign Materials (FM) observed in certain blood circulation medical devices. The high sensitivity of the assay is very critical for my application. The assay has good linearity, it is very helpful. I also want to comment on the fast delivery of the product and easy of use for the product ordering on line. 1. Once the biotinilated antibody is reconstituted, how long can it be stored for? And at what temp should it be stored? 2. What is the difference between the Standard and Control? 3. Are both the Standard and Control vials lyophilized? 2. Standards and Controls are provided lyophilized and should be reconstituted either by the volume stated on the vial or in the Protocol Booklet. They should be used directly once reconstituted and can't be stored. 3. The Standard and Control are both made with recombinant IL-6, only the concentration differs. Thank you for looking into this so efficiently. I would greatly appreciate a replacement as soon as possible to the address below. I am sorry this product did not perform as stated on the datasheet and for the inconvenience this has caused. As requested, I have issued a free of charge replacement with the order number 1202121. Please note that our source for this kit is kindly providing this replacement, and so we are waiting for this to come to us before we can send it to you. I do not anticipate this will take too long. They are providing a different lot. The free of charge replacement kit will also covered by our Abpromise guarantee. Should you still be experiencing difficulties, or if you have any further questions, please do not hesitate to let me know. I have reviewed this enquiry and discussed it with the originator of this kit. Regrettably, it does seem the second kit is not providing the sensitive results you require. I appreciate the time you have spent on these experiments and would be pleased to arrange a free of charge replacement or credit note in compensation for the second kit which did not work so well. Thank you for taking the time to contact us. Your message has been forwarded to the scientific support team. I am sorry to hear you have had difficulty obtaining satisfactory results from the second kit you received. I would like to reassure you that ab46042 is tested and covered by our 6 month guarantee for ELISA on human samples. In the event that a product is not functioning in the applications cited on the product data sheet, we will be pleased to provide a credit note or free of charge replacement. 2. What type of samples have been tested, from which species? 3. What were the kit storage conditions? 4. Please describe the problem in further detail. I would appreciate if you are able to provide some data, particularly the standard curves from each kit, which will help me to assess the results. Thank you for your cooperation. Please do not hesitate to contact me again with the further requested details and I hope we can resolve this case for you as soon as possible. 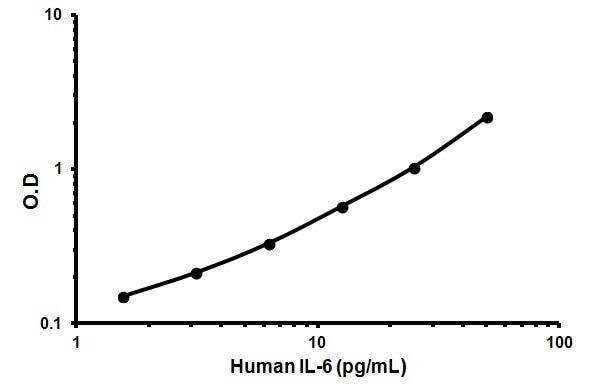 What is the difference between the Interleukin 6 High Sensitivity Human ELISA kit and the Interleukin 6 Human ELISA kit. When ordering for the 2 products, do I have to pay seperately for shipping charges? Do you have the catalogue numbers of the kits you're inquiring about? We have 7 different IL6 Human ELISA kits in the catalogue: ab46044, ab46042, ab46027, ab46041, ab100572, ab100573 and ab108867. The IL6 High Sensitivity kits (ab46044 and ab46042) are the same, just one is 1 x 96 tests and one is 2 x 96 tests. These are high sensitivity at < 0.8 pg/ml and is in sandwich format and works with cell culture supernatant, Serum, and Plasma. The ab46027 works with Cell culture supernatant, Serum, and Plasma as well in a sandwich format, but the sensitivity is < 2 pg/ml, but greater recovery. The ab100572 has a broader range 1.37 pg/ml - 1000 pg/ml but < 3 pg/ml sensitivity. This works in Cell culture supernatant, Serum, and Plasma as well. The ab100573 is the same as ab100572, except that ab100573 is recommended for cell culture extracts and tissue extracts. The ab1008867 works with works with Cell culture supernatant, Serum, and Plasma as well in a sandwich format but is the least sensitive (8 pg/ml). If you purchase multiple kits, you will only pay 1 shipping charge. If an item on your order is out of stock, your order will be on hold until it is ready to ship. However, you can choose to "split" your order to receive the in-stock item the next day, and the out of stock item when it comes in, but you would have to pay for both shipping charges in that case. have saliva samples been tested with this kit? Saliva is suitable for thisELISA kit, and the regular protocol would apply. There is no need to pre-treat the samples before assaying. i have added 1 ml of standarddilutenthuman serum into the control IL-6HS, and for standard IL-6HS i didre suspendedit in 1.38 ml of standard diluent human serum. thank you for your support. I have noticed that the results that you provided me with, there is a difference between the positive and negative samples by eye. How has your spectrophotometer been set up to measure this? At what wavelength have you been reading? How long did you leave the colour to develop with the TMB substrate? Also, I am not sure of the dilutions you describe. What was the control IL-6HS and standard IL-6HS? You were provided with a vial of control, was this reconstituted in 1 mL of human serum diluent, then diluted further? I am sorry for all the questions but I am trying to isolate which step may be contributing to these problems. I am also waiting on some further feedback from the lab and hopefully they will have some further suggestions to make. I am sorry for the delay and the inconvenience this may be causing you. please find attached doc for the result i got with the new kit, i need your thought about it . I am sorry for the delay in getting back to you. I think it would be very helpful for us to understand exactly how the standard samples and streptavidin HRP was prepared. As you say, this kit has been extensively optimised to allow the customer to simply use it without performing extra optimisation. We have had no other reports of the kit not working as expected and its quite a popular kit. I would therefore really like to understand in detail how the solutions were made up in order to try and help you as best I can. Can you therefore state, in uL, how each solution used was made up and diluted? I really appreciate your help and hope that I can advise you as to how to get the best results out of this kit.